Flotation is a complex process that is affected by a multitude of factors. These factors may be inherent in the circuit design, or in how the flotation plant is operated. The FloatStar suite of control modules utilises advanced process control to overcome design-related limitations and maximise circuit performance during operation. As far as possible, the FloatStar control modules are designed to be implemented with little or no additional instrumentation. This modular approach ensures the design of a customised solution, specific to the objectives of each plant. Furthermore, this approach allows for phased implementations which are useful both in assessing the benefit of the system, and in allowing plant personnel to be introduced gradually to any changes in operation (Change-Management). The FloatStar Level Stabiliser has been implemented on flotation circuits around the world. It has repeatedly been proven efficient in rejection of disturbances, and in rapid tracking of setpoints. The main difficulty in controlling flotation levels is that they form part of a highly interconnected system. The control actions of one bank will therefore influence other banks and, unless handled correctly, disturbances will propagate through the circuit. This means that good level stabilisation control cannot be achieved by using controllers that only act locally. With the FloatStar Level Stabiliser providing circuit stability and rapid setpoint tracking, it then becomes possible to consider flotation optimisation. Controllers must not only perform well in the conditions under which they were installed and tuned, but must also be robust through fluctuating plant conditions. 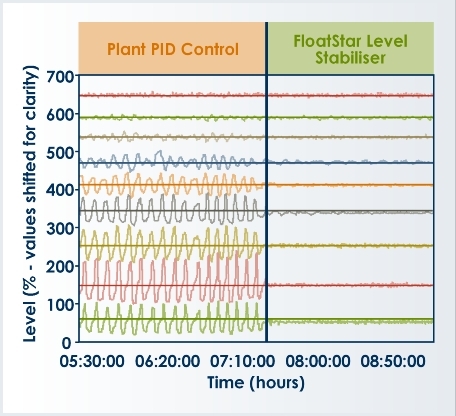 The FloatStar Performance Monitor keeps track of controller performance at all times, and produces useful diagnostic information to analyse when and why controllers are not performing at their peak. Both plant personnel and control engineers will find this information useful in ensuring that their controllers are always performing well. Compensating for changing feed conditions. 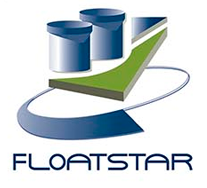 Click here to view and download the FloatStar brochure.